(L-R): Robert Aderholt, Alabama congressman; Terry Roberts, Lamar County commissioner; and Gerald Allen, Alabama state senator, talk during the economic development forum and plant tour. 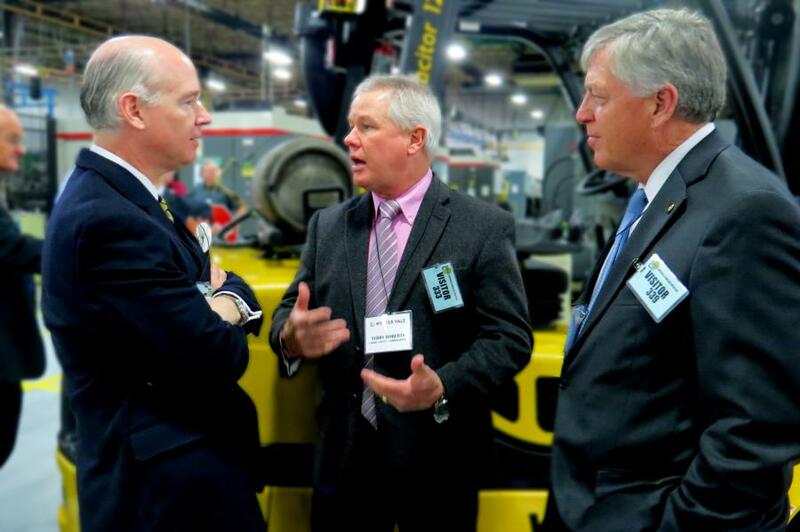 Hyster-Yale Group recently hosted an economic development forum at its Sulligent, Ala., facility that was attended by more than 20 national, state and local elected officials including Alabama Congressman Robert Aderholt. The plant tour and discussion with company executives allowed lawmakers and business leaders to see firsthand the facility's contribution to the local economy, and a chance to discuss issues and legislation affecting U.S. manufacturing. Hyster-Yale Group is the largest employer in Lamar County, drawing workers from two states and 11 counties. Opened in 1970, the facility manufactures component parts, cylinders and transmissions for Hyster and Yale lift trucks sold around the world. Aderholt pointed to the facility as an example of U.S. manufacturing success. He emphasized that lawmakers can help companies like Hyster-Yale Group succeed and grow by limiting restrictive legislation.